Matthias Giroud joined Le Cordon Bleu Pâtisserie Chef Nick Patterson on Tuesday 20th November, for an evening of Mixology and Pâtisserie. Matthias is the Executive Chef for Worldwide George V Eatertainment Group (Buddha Bar) and Co-Founder of WM.Signature. The concept behind WM.Signature is to create unique beverages experiences for bars, restaurants, hotels, beverage groups and brands around the world. Matthias began the evening with an introduction to the bar and mixology world, before leading a unique demonstration and cocktail & mocktail tasting which was inspired by the perfume world. What at first might seem like a strange combination soon makes complete sense once you consider that 98% of perfumes are based on natural, edible essential oils, and that smell can account for over 75% of a flavours impact. 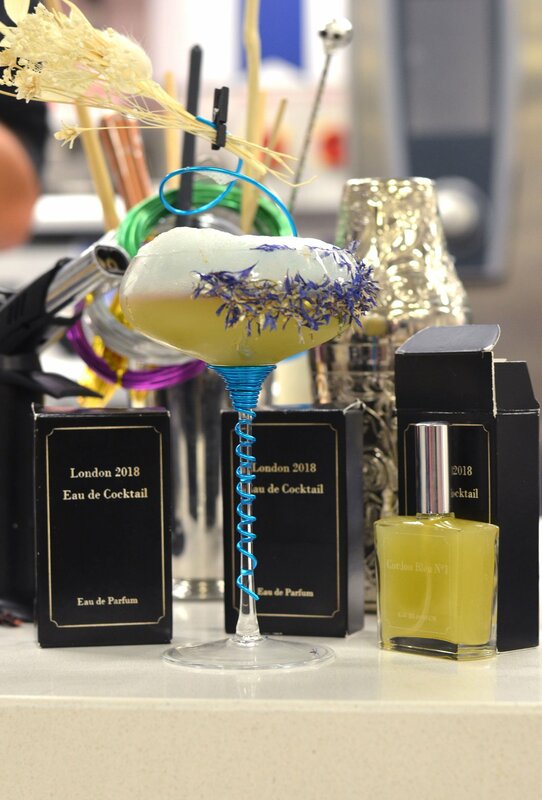 The first creation titled Eau de Cocktail was presented beautifully (pictured above) and included infused gin, yuzu and agave, as well as the addition of a honey painted glass, a spray of orange blossom and cornflower clipped above the drink. This cleverly created an even greater depth of flavour through the addition of smells, while also adding to the experience of the final cocktail. Alongside the elaborate presentation of the cocktail, Matthias also bottled the cocktail in a faux perfume, complete with a working spray adding a playful element to an already spectacular cocktail drinking experience. 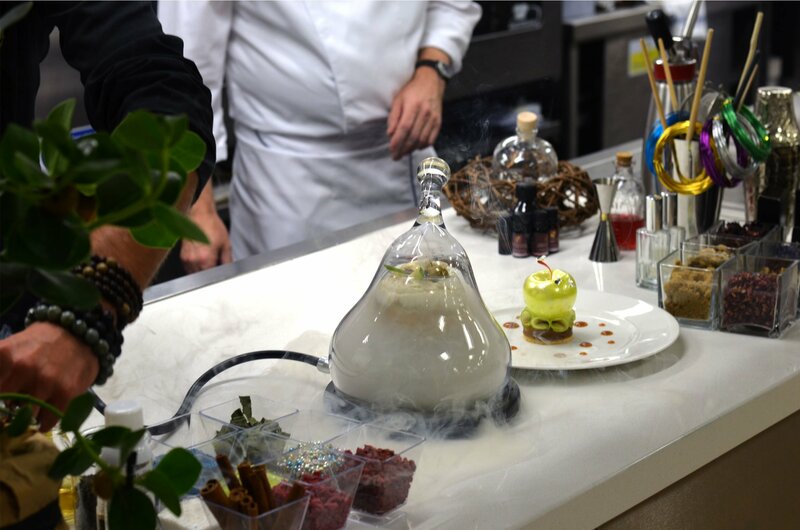 The two chefs then went toe to toe challenging each other to create a cocktail or pastry which paired or matched the other in every aspect, from presentation to flavour combinations. First up was Chef Nick Patterson who was tasked with creating a dessert which drew inspiration from one of Matthias’ signature cocktails. Titled Travel Cloudy Box, this non-alcoholic cocktail features hibiscus infused soda, agave, mandarin and passion fruit. Added influence from Matthias’ own travels to far flung destinations around the world can be found with the additional inclusion of pandan, ginger and Tasmanian berry, bringing Matthias’ own story and experiences through to the cocktail. As if this wasn’t enough, once the cocktail had been ‘boxed’ smoke was added to it, increasing the complexity of flavour. Chef Nick’s response was a selection of Milk Chocolate and Praline Textures, which included some stunning flavours and techniques such as orange compote, caramelised bananas, hazelnut sponge, cocoa streusel and a chocolate maple tuile. To draw on the fruity flavours of the cocktail, Chef Nick also incorporated passionfruit puree and orange juice in various elements of the dessert to ensure notes of fruitiness could be tasted. Next it was Matthias who had to create a cocktail inspired by Chef Nick’s Modern Apple Tart Tatin. The tart tatin features a blown sugar apple as its centrepiece, atop an apple millefeuille, a disc of linzer sablés and apple confit. Matthias more than delivered with a cocktail he named From the Tree. An apple-based cocktail that includes calvados which is combined with vanilla pods and placed into a sous vide bath, allowing the two flavours to combine. Topped with a cider foam, this was presented in the stunning manner to be expected from Matthias, with added cinnamon smoke included for good measure. To conclude the evening there was a question and answer session with Matthias which covered everything from the pairing of exotic ingredients to the storytelling that accompanies each of his experiential cocktails. 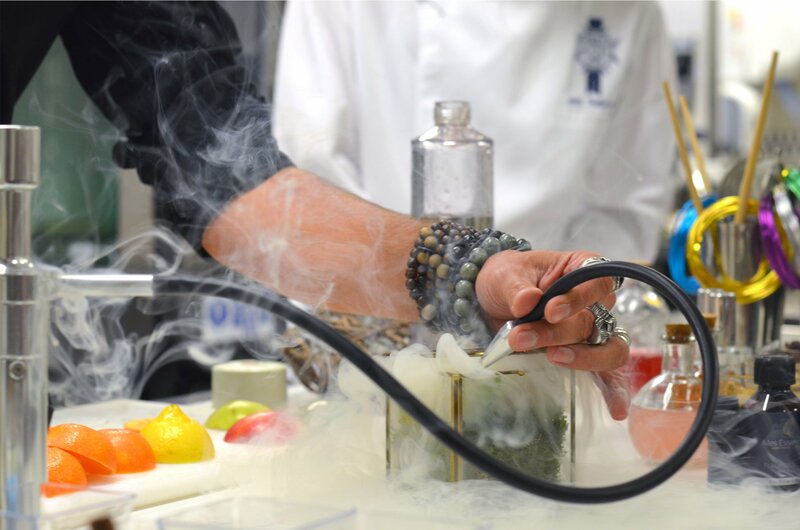 Head to our demonstrations and conferences page to attend one of our future guest chef events, or for more information about our courses visit our programmes page.